Residents walk though the site of a suicide attack in Kabul, Afghanistan, March 2, 2018. A large explosion in the eastern part of the Afghan capital on Friday morning killed at least one person and wounding others an Afghan official said. Afghan authorities say a suicide bomber detonated his explosives-laden car Friday near a NATO convoy in the capital, Kabul, killing a six-year old girl and wounding 14 other people. Police spokesman Baser Mujahid told VOA the attack happened near a foreign military base on a main road linking Kabul with the eastern city of Jalalabad. 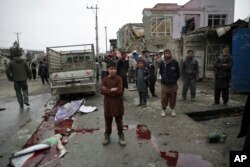 He said civilians were among the victims, but the blast did not harm international troops. Kabul has been the scene of some of the deadliest militant attacks in recent months. Residents walk through the site of a suicide attack in Kabul, Afghanistan, March 2, 2018. A large explosion in the eastern part of the Afghan capital on Friday morning killed at least one and wounding others officials said. A Taliban suicide bomber detonated an explosives-packed ambulance in a central part of the city on January 27, killing some 100 people. The massive blast came just days after the insurgent group staged a deadly assault on Kabul’s Intercontinental Hotel. Friday’s bombing came two days after the city hosted a high-profile international conference where President Ashraf Ghani offered unconditional peace talks to the Taliban. Meanwhile, the Taliban says it has freed five of the 19 government forces and officials taken hostage earlier this week on the main highway between southern Kandahar and Uruzgan provinces. The insurgent group, in a statement issued Friday, said the fate of the remaining hostages will be determined by the relevant Taliban department. It claimed an Uruzgan government spokesman is among them.